Wu-Tang Clan's Method Man, an established actor already, now has his own graphic novel. The formidable Wu-Tang Clan has always wrapped themselves in a multilayered, if somewhat convoluted, mythology based on Shaolin martial arts, as translated into the lives of the rappers themselves. As humongous fans of vintage kung-fu flicks, it's no surprise that superhero comic books get a shout-out as well. 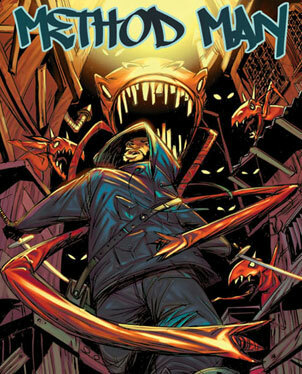 The first Clansman to get his own graphic novel is Method Man, already a multithreat as an established actor. His self-titled book ("Method Man" from Grand Central Publishing), with artist Sanford Greene and writer David Atchinson working off an original concept of Meth's, will be sure to please fans with its constant stream of hard-core beatdowns. In an interview with Entertainment Weekly done at the recent San Diego Comic-Con, Meth said he wanted his book to have "a lot of action, not too much talky-talky s---." Well, he got that in spades. Meth is transformed into freelance private investigator Peerless Poe, a former top agent of the Order, made up of an elite group of murderous priests. He's called back into action and, with the help of three other "Occisors," do battle with the evil Lilith and her spawn. Greene's graffiti-inspired art is the perfect compliment to Meth's basic storyline, but the interlude that tries to explain the whole Order backstory only bogs down the swiftly rendered action. With plans for Ghostface Killah and the GZA to get the comic-book treatment as well, the Clan will live on, at least more on the page than on the stage.